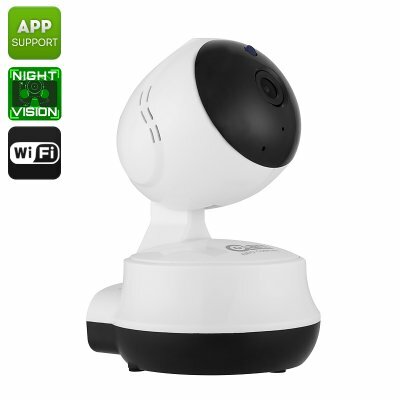 Successfully Added IP Camera Neo Coolcam NIP-61GE - 1MP CMOS, 720p, IR Cut, 10m Night Vision, Motion Detection, App Support, WiFi, Dual-Way Audio to your Shopping Cart. Keep track of all what’s happening inside your home or office with the Neo Coolcam NIP-61GE IP camera. This mini security camera features an easy plug and play design. Simply plug it in, and you’ll be ready to go. Thanks to its WiFi support, you will be able to access a live video stream through your iOS or Android smartphone. All you have to do is install the dedicated Application, and you’ll always be able to see what’s going on in your property even when you’re not personally around. With this HD IP camera, you’ll constantly be up to date on the current security status of your home. This IP camera features a 1/4-Inch 1MP CMOS sensor. Therefore, it is capable of producing crisp 720p HD footage. Thanks to this, you’ll always be treated with clear and detailed images. From now on, not a single person will be able to enter your property again without being seen. Your IP camera furthermore supports a motion detection alarm. This little feature makes sure that not a single movement stays uncaptured. With its 60-degree viewing angle, you’ll be treated to a wide view that covers your entire room. With Dual-Way Audio, this security camera allows you to talk to visitors and possible intruders from afar. To make sure you’ll be treated to detailed images around the clock, your security camera supports IR cut and 10m night vision. Thanks to this, your property will be fully protected at both day and night. All your footage will be stored instantly on your camera’s 64GB SD card. Therefore, you can be assured that you’ll always be able to watch back previously recorded video whenever necessary.